Truth is the first casualty in the digital war for attention. Throughout 2013, a rash of hoaxes perpetuated online have reminded us of the fragile nature of credibility in the digital world. So many attention-grubbing pranksters have hijacked digital media that CNN has declared 2013 as the year of the hoax. But 2013 is just the tip of the iceberg. Hoaxes perpetrated by entertainers, everyday people, and brands threaten to disrupt the Internet on a constant basis. Just within recent days, a rash of self-promotional hoaxes have bamboozled the news media, tarnished a national brand, and shamelessly capitalized on the death of a global hero to sling mud at a celebrity. In all cases, hoaxers are taking advantage of the “me, too, me, first” culture that pervades the digital world. It’s time to slow down and exercise some good old-fashioned critical thinking. Gale’s stunt was followed shortly by an incident in which comedian Randy Liedtke pranked comedian Kyle Kinane. Liedtke’s ruse involved using an unauthorized Pace Foods salsa Twitter account to engage in an embarrassing, obscenity-laden war of words with Walsh. 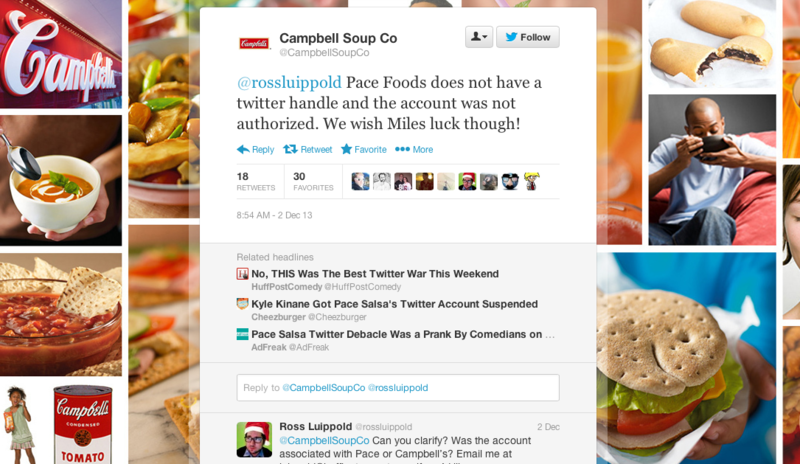 Before the dust settled, Pace’s name was dragged through the mud by news media unaware that the division of Campbell Soup Company had nothing to do with the fake war of words. For instance, Business Insider reported, “Pace Picante Stirs up a Social Media Fail” before the entire incident was revealed as a hoax. A third, and most blatantly malicious prank, occurred on December 5 when the death of Nelson Mandela was announced. Amid the outpouring of goodwill and tribute for the fallen leader, a Twitter account known as @DeletedTweets spread a fake tweet of Paris Hilton confusing Nelson Mandela with Martin Luther King, which fooled a few bloggers and celebrity news sites, such as Yardbarker and Gamedayr. However, Buzzfeed, perhaps still smarting from being fooled by Elan Gale, was quick to call foul on the hoax. The short-lived account apparently specialized in sharing fake tweets from celebrities such as Beyonce, according to Buzzfeed. Me, too: We are all media now — brands, publishers, and people. More than 156 million blogs exist, more than 1 billion people share content on Facebook, and 500 million people post 340 million tweets a day. Each day it gets more difficult to capture anyone’s attention with so many of us blogging, tweeting, Facebooking, Instagramming, YouTubing, and otherwise creating a blizzard of white noise. I wouldn’t be surprised to see even more stunts and hoaxes occur in 2014. After all, Gale’s Twitter following jumped by 140,000 people as a result of his in-flight hoax. Moreover, self-publishers (like me) have no one to tell us “You know, let’s think through that juvenile prank you’re about to pull before you debase a brand.” We are our own judge and jury, and if our idea is engaging enough, we can create an instant viral storm as quickly as igniting a fire in a woodshed. Me, first. We — both the news media and everyday people like you and me — all want to be first to share interesting content. And if we can’t be first, we certainly don’t want to succumb to fear of being left out when our friends start a Facebook conversation about some sensational news item making the rounds of the Internet. And if we are occasionally duped by a falsehood, we can laugh off our mistake. The problem is that when we share inaccurate information during a tragic time, such as in the aftermath of the Boston Marathon bombings, we add to public confusion and potentially compromise safety. Even worse, citizen journalists, who shoot first and ask questions later, create pressure on journalists to do the same. The pressure to be report a news scoop has always been an occupational hazard that threatens journalistic integrity. But in the digital age, the risk is to cut corners by reporting news without verifying its accuracy is even greater, which contributes to the spread of hoaxes. The digital world also falls prey to a misplaced, naive belief in the “transparency” of social media. When social media exploded in the first decade of the 21st century, the pundits hailed a new era of digital glasnost. The social world was supposed to make corporations more open and authentic, and society as a whole more open and interconnected as we shared our lives on networks like Facebook. And, to a great extent, we do live in a more transparent age. But as it turns out, the low barriers of entry to social — you can create a Facebook account in minutes — also make it too easy to manufacture a falsehood. To wit: it’s a lot easier to create a fake Twitter account than it is to manufacture a phony passport. First, resist the urge to instantly share a sensational story. Read the article or watch whatever funky YouTube incident has caught your attention. Then take a step back and do nothing for a while. Take a deep breath. Forget about trying to be first to share the news — chances are, someone has beaten you to the punch, anyway. Do some digging. At a minimum, Google the story elsewhere. The story might have been exposed as a hoax already. Check the source of information, especially when something serious is being reported. If you are uncertain about the credentials of the person reporting news, keep looking for more sources that seem credible. Of course, even credible news reporting sources can get fooled, as we’ve seen, but by checking multiple sources that you trust, you’ll certainly reduce the chances of falling prey to a hoax. Take a deep breath. Slow down. Think before you act. This entry was posted in Media, Social media and tagged @DeletedTweets, Buzzfeed, Caitlin Dewey, CNN, David Deal, Elan Gale, Facebook, hoaxes, Huffington Post, Kyle Kinane, Pace Salsa, Paris Hilton, Randy Liedtke, Superhype, Twitter, USAirways. Bookmark the permalink.